Remember the Seinfeld episode where Jerry and Kramer’s apartment building was switched to low-flow, causing them distress and misery? The moral of the story is that if you’re showering with low-pressure water, you’re not living the best possible life. It’s our belief that you deserve a powerful shower that leaves you feeling clean and refreshed! But if you’ve got low pressure in your home, the only solution is to spend thousands of dollars transforming your entire water supply with some machinery you might find at an Olympic swimming facility. I guess you should get on the phone to your local plumber – you know, the one with the 200 dollar consulting fee. Wait, stop! Put the phone down! I just remembered what happens in that Seinfeld episode – Kramer buys a high-pressure shower head and rejoices. But do such miracle products exist in the real world? You bet they do! Are they crazy expensive? No! Most of them are like 30 bucks and the very best one is under 70. So let me ask you a question – would you spend 70 dollars to make your life and the life of everyone in your home noticeably better – forever? Of course you would. The only problem is choosing which product to buy. That’s why we’ve compiled this little guide to the best of the best high-flow shower heads. Whichever you choose, we guarantee you’ll never go back to low-flow. 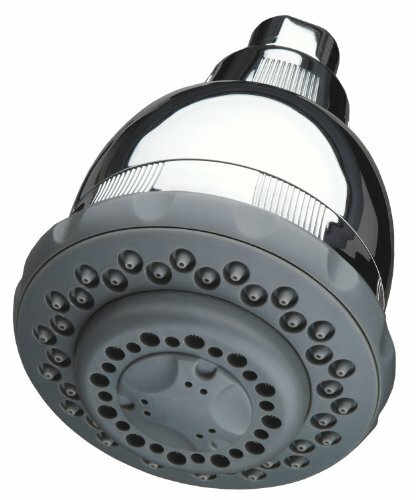 A high pressure shower head is a shower head whose main purpose is to intensify the water pressure of your shower. This allows for a more enjoyable showering experience such as you’d get in an expensive spa hotel – and here at Complete Home Spa we’re all about bringing the spa experience into the home. It’s heaven on your tired muscles, it makes you feel cleaner, faster, and you can even save water. High pressure shower heads work in two ways – either by having fewer holes for the water to come out (=more pressure) or by adding a pressure chamber that forces the water out faster. In short, they add pressure on their own without you needing to do anything complicated with your pipes. In addition to boosting your water pressure, the best high pressure shower heads have a variety of spray patterns that range from a soothing mist to a therapeutic massage, so they’re really perfect for our home spa concept. At the same time, a high pressure shower head also assists you in conserving water, since you no longer need to waste a lot of water to get the same force. Additionally, the best high pressure shower head will include water conservation spray patterns in its choices, which are great for times you really need to make every drop count. Size: This mainly refers to the radius of the shower head. Wider is generally better as you get more coverage —but you want to make sure it will fit in your shower stall if space is an issue. Flow Rate: Premium high pressure shower heads generally have a flow rate of 2.5 gallons per minute. Installation: Wall-mounted vs ceiling-mounted—check the model specifics carefully versus your available plumbing. Will it fit your existing shower arm? If not, you can purchase a new one to go with it. Style: Premium high pressure shower heads are designed to fit right in with hotel bathrooms, so they generally have a luxurious look to them. However, they can still have varying styles to them, from classic to modern. You’ll also get a choice of color with some models. It should be possible to find one that perfectly suits your bathroom. Price: You’ll need to gauge your budget and how much you’re willing to spend. We’re quite frugal but believe that spending more on a good shower head is a good investment since the product has a long lifespan and will give you so much pleasure. Warranty: These can range anywhere from 1 year to a lifetime limited warranty. Of course, the longer, the better! Reviews: In addition to our reviews, you can see what customers just like you thought about the products on the Amazon sales page. Check out our Top 5 picks – any will do a good job, so read the description and look at the style to find the one that’s right for your bathroom. A-Flow’s shower head is a great option. 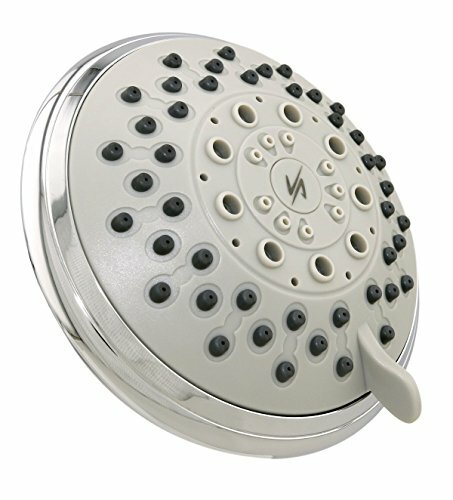 It’s made of ABS (also known as plastic) with chrome plating, so that water spots don’t leave permanent stains on it. It’s sized 6.7 x 4 x 6.6 inches and comes just in 1 color: Chrome. It has a swivel ball that lets you turn the shower head angle to your heart’s content. This product is made in the USA. This model has 5 spa-like spray modes to choose from: Massage, Mist, Aeration, Pause, and Rain. You can just turn the dial on the shower head to pick the mode you want. The Pause and Aeration modes are aimed more at conserving water. Aeration will slow the water flow while still giving you a shower experience that feels good. Pause will shrink the water flow to a trickle. That’s great if you’ve got one of those bathrooms that likes to give you a final blast of freezing water when you turn off the shower – you can Pause, then turn the water off at the faucet. The first notable feature is that this shower head’s radius is remarkably wide compared to its competitors, at 6 inches across. Then, as to be expected from the products on this list, it has remarkably high pressure and delivers an intense shower spray. Our favorite mode from the 5 was ‘Massage’ – its a strong therapeutic massage to loosen you up after a long day. The parts are universal so no need to worry – they fit standard plumbing. It’s easy to install with no need of tools. Teflon tape is included with the purchase so you can use it to wrap around the shower arm, then screw the shower head on. A-Flow provides a lifetime warranty for this product. Relaxing and soothing luxurious spa-like experience - Features five functions; including rain, massage, mist, aeration and pause. Vida Alegria’s nifty spa shower head is another worthy contender for your attention. It’s sized 4.7 x 4.7 x 3.7 inches and comes in a single color: Chrome Polished Nickel (with a white face). It has a water flow rate of 2.5 gallons per minute. This product is made in China. Like the A-Flow, this is made of ABS with chrome plating. The plastic keeps it from being stained by water over time, unlike chrome. Its silicone jets are made to be easy to clean by simply wiping your finger over them. It comes with a brass connector to the water supply and a flow restrictor. There are 3 interesting features of note about Vida Alegria’s high pressure shower head. First, it has 5 modes for its spray: Power Massage, Pressure Drench, 2 Mixes, Relaxing Rain, and Drizzle. This isn’t completely different from its competitors. What’s interesting is that the Drizzle mode is a water-saving one, meant for conserving white water in RVs and boats. This is quite specific, of course, but you’re also free to use it if you should need to save water in any other situation. Second, also notable is that their shower head uses a solid brass ball joint, unlike the plastic kind used by many of its competitors on the market. The brass ball joint allows for a water-tight and solid attachment of the joint to the metal shower arm, because you can tighten it with no fear of it cracking or breaking. The same cannot be said for comparatively more brittle plastic ball joints. Third, this high pressure shower head comes with a flow restrictor that’s easy to remove if you should choose to do so. The flow restrictor being removable is handy if you should have have a low pressure problem or just want more spray intensity in general. Just take it out and up goes your spray power. Sound good to you? Then check out the latest price and availability with our little button below. This high pressure shower head is wall-mounted. It comes with a free roll of Teflon tape for use in installation. There are detailed instructions included for both the shower head installation and the flow restrictor removal. Vida Alegria provides a 3-year warranty for this product. The Culligan WSH-C124 is another possibility. It’s sized 5 x 9 x 13 inches and comes in 2 colors for you to choose from: Chrome and Red. It has rubber spray nozzles that are resistant to clogging. Its construction is of ABS (plastic) with a chrome finish, which keeps water stains from spotting it like it would a solid chrome shower head. Its water flow is 2.5 gallons per minute. This product is made in the USA. This high pressure shower head has 5 spray settings for you to pick from, from a full body coverage spray to a pulsing spray that massages your muscles (yes, your shower will now massage you). The highest pressure setting may prove too strong for you if you’re especially sensitive, but it can serve as a vigorous massage. The Culligan WSH-C124 high pressure shower head has a patented filter to make sure your shower is chemical-free. This powerful filter greatly cuts down on chlorine, which in turn reduces noxious sulfur smells that may be in your water, as well as mineral buildup. Additionally, it also filters out impurities that may damage your hair and scalp. Many people who install this are amazed at the difference and scandalized by how much chlorine they were breathing in before installing this shower head. It has a filter capacity of 10,000 gallons (which is approximately 6 months’ worth of showers) before it needs changing. In fact, Culligan’s shower head’s description starts with “Cleaner, fresher-tasting water for ice cubes and beverages”. Culligan shower head, bringing you water you can shower with, or drink. This high pressure shower head is wall-mounted. It’s easy to install and requires no tools to do so. It comes with Teflon tape, which you wrap around your existing shower arm. Then you attach the shower head. Culligan provides a 5-year manufacturer’s limited warranty with this product. It is NSF certified. It’s easy to see why the Speakman S-2005-HB high pressure shower head is near the top of our list. Sized 5.4 x 3.2 x 3.2 inches, this shower head comes in 4 colors for you to choose from: Brushed Chrome, Brushed Nickel, Polished Brass, Polished Chrome. It’s made of light engineered plastic with a chrome finish, so that water won’t leave stains on it over time the way it would solid chrome. It has a 2.5 gallon per minute water flow. This product is made in the USA. The reason it has “hotel” in its name is that it’s the same quality grade as the high pressure shower heads used in hotels, and is in fact found in Marriott and Renaissance Hotels and Resorts. Enjoy that luxurious hotel feeling in your own home! 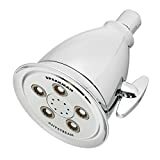 This high pressure shower head has 5 fully adjustable water jets, capable of producing 8 massage sprays and 50 water streams. Through their patented Anystream Technology, you can just turn the shower head’s handle to choose from full coverage, combination spray, massage streams, and gentle rain. 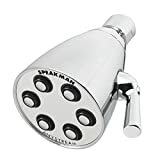 And if you hate shower heads getting clogged up, this next notable feature may make Speakman’s product the best high pressure shower head for you. This product is wall-mounted and will fit standard plumbing connections in the US. It comes with plumber’s tape, which you wrap around your existing shower arm. Then you screw the Speakman shower head onto it, and you’re good to go. The Speakman S-2252 bears a lot of resemblance to its sibling S-2005-HB mentioned just above. However, it’s clearly got some significant pluses to it that make it worth its more premium price (though it’s still cheaper than a meal in a restaurant). Let’s see why it edges out the S-2252 as the best high pressure shower head. In size it’s just a little smaller than the S-2005-HB, measuring 4 x 2.8 x 4 inches. It’s pretty heavy and feels quite well-made. It has an extra color to choose from, boasting 5 choices instead of 4: Brushed Nickel, Oil Rubbed Brass, Polished Brass, Polished Nickel, and Polished Chrome. Like its sibling, its water flow is 2.5 gallons per minute, and it’s manufactured in the USA. (It’s still hotel grade quality, despite not being named as such). The Speakman S-2252 has 6 fully adjustable jets and 64 powerful water sprays, compared to the S-2005-HB’s 5 jets and 50 sprays. It also has 6 patented plungers and 48 sprays. The patented Anystream® 360 degree technology lets you infinitely turn the shower head handle to choose a spray pattern that suits you, from powerful full-body coverage to a gentle drizzle. The Speakman S-2252 also has patented self-cleaning nozzles to make sure it doesn’t get clogged with mineral buildup. You’ll only have to do the occasional clean of the outer surface of the shower head with mild soap and warm water. 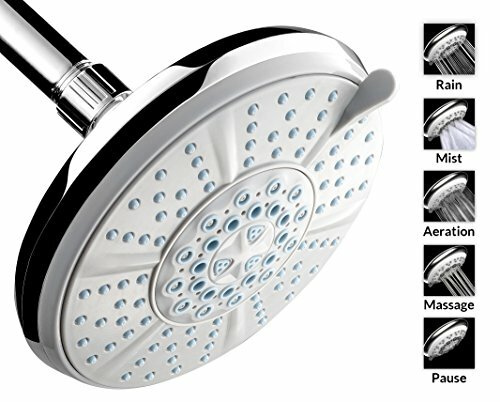 Build quality plus these great features make the Speakman S-2252 the very best high pressure shower head. The S-2252 is wall-mounted and will fit all standard US plumbing connections. It comes with a roll of plumber’s tape. You wrap the tape around your shower arm, then attach this shower head and you’re ready to take your luxury hotel shower. Speakman provides a lifetime limited warranty on this product. We hope you found this guide helpful and wish you many relaxing, luxurious showers to come.